This is the largest octopus commonly seen in Sydney and grows to about 80 m. Unlike cuttlefishes and squids, octopuses have no shell at all. Their fleshy mantle can be used for jet propulsion by sucking in water and squirting it out through their syphon. Most of the time though, they use their eight suckered arms to creep about over rock surfaces in search of food. The undersides of the arms are rust-red in colour, tapering to a tip, which may be the first thing you spot emerging from under a rock ledge. 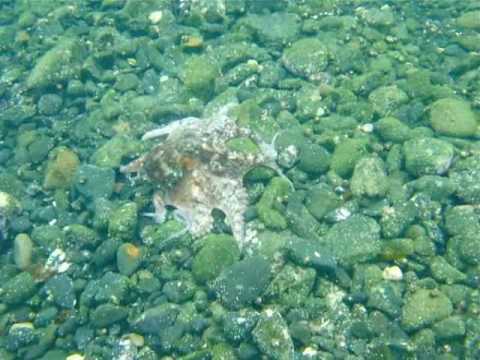 The octopus is territorial and sits in its lair during the day surrounded by rocks and rubble that it has collected to defend its home. At night it hunts using its sharp beak to feed on crabs and molluscs, such as snails and bivalves. It can change the colour of its skin (normally mottled brown) and shape to imitate seaweed. 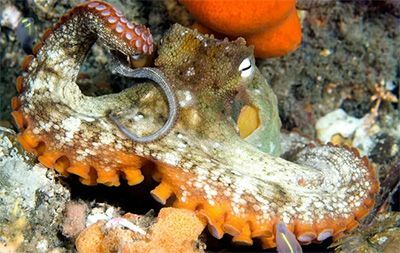 Octopuses are protected and cannot be taken from ocean rock platforms or Sydney Harbour.